Is Snowdon still Britain’s Safest Mountain? Snowdon has the reputation of being one of the safest mountains to climb in the UK, but that does not mean that it should not be treated with the same respect as any other mountain. In February 2009, two experienced climbers and two hill walkers lost their lives in an eight day period when bad weather hit the mountain. In 2012 Llanberis Mountain Rescue has had one of its busiest years haveing been called out on over 180 occasions. Summer temperatures may have come to a shock for some as the summit recorded only 5 degrees centigrade. 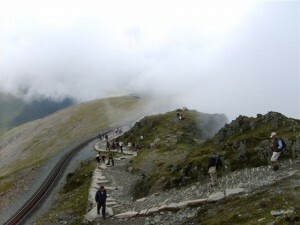 Ascended by 1000′s of people daily it’s hard to imagine that walking up Snowdon is anything but safe. It is now a week since Gerry Coyle was last seen at the summit cafe and he was believed to have decided to walk down, having come up on the train. It was a dry day so conditions were probably about as good as you can get on an autumnal day. He texted his wife from the top, but that was the last that was seen or heard from him. His family say he was very organised, not one to take off on his own. Being a keen photographer he also had a camera and tripod with him, but neither of these have been found. His wife, two sons and two brothers are anxiously waiting at a local hotel for news. So where has Mr Colye disappeared too? With deteriorating weather conditions since he went missing the police, mountain rescue, the search and rescue dog association and the RAF Mountain Rescue have been searching for him, and are getting increasingly concerned. So, is Mount Snowdon a safe mountain to climb? The number of people who don’t think it is a serious walk is astounding. It is quite usual to pass people walking up in flimsy trainers and without proper clothing, seemingly insensible of how weather conditions can change quickly in the mountains, and how much colder it will be at the summit. People walking without maps and compasses are commonplace. Even with navigational aids it is quite possible to get disoriented in thick fog and to quickly get into trouble – whilst the main paths are quite safe, step off these and you can be faced with sudden steep drop offs and cliff edges. Mountain Rescue’s advice just this week was if you get into trouble – call for help. Do not carry on in the hope you might find your path again, or be able to retrace your steps. If you are walking on or around Snowdon, keep an eye out for Gerry Coyle – and lets hope that he is found safely. And if you’re planning a trip, check the weather and make sure you are prepared for the conditions on the day. And be ready to turn back if the weather worsens. There’ll always be another day to climb to the summit. So please, be sensible about Winter climbing… it may just feel like a hike, but the fog comes down quickly at altitude and it can get very cold. Treat these beautiful places with respect… and you will stay safe. Its not fair that the good people of mountain rescue have to risk their lives because of your poor preparation.